Showing results for tags 'magic mushrooms'. 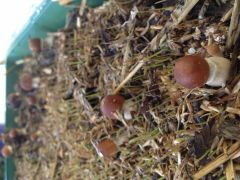 Young Psillicybe shrooms popping through a casing of rye grass seed. I used the fine seed as a casing layer to give a nice background on the shrooms when I took a photo. In hindsight it wasn't such a good idea as the grass quickly depleted the nitrogen and food which mushrooms needed to continue to grow.